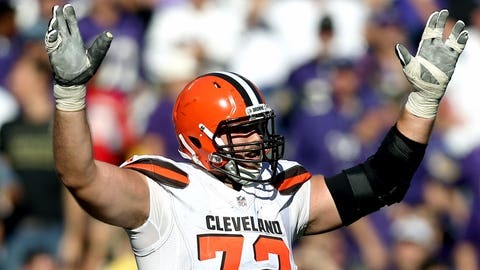 Browns right tackle Mitchell Schwartz is Pro Football Focus' best right tackle through six weeks. Neutralizing Broncos pass rusher Von Miller helped Mitchell Schwartz vault to the top of Pro Football Focus' right tackle ratings. Will a contract extension in Cleveland follow? Schwartz earned a +1.9 grade for holding Miller to his worst pass rush grade of the season in Sunday's overtime loss to Denver, and now sits atop PFF's rankings for right tackles through six weeks. Schwartz often gets the short end of the stick in terms of praise for the Browns' offensive line, but he'll take the positive review, even if he believes grading offensive linemen is a tough task for outside evaluators. The recognition couldn't come at a better time for Schwartz, who is playing in the final year of his contract. He claims he hasn't given his status beyond this year much thought, however. Browns coach Mike Pettine sounded non-committal on Schwartz's future in Cleveland as well. “[Schwartz] is a high producer for us, but behind the scenes, we know whose contracts are up, and that’s not really my place to talk about that, especially in season,” Pettine said, per the Akron Beacon Journal.